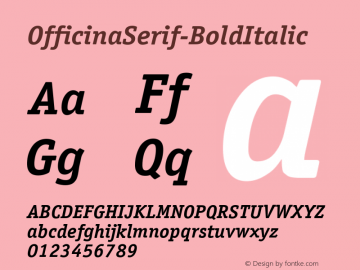 OfficinaSerif-BoldItalic font family series mainly provide Regular and other font styles. OfficinaSerif font family series mainly provide Bold and other font styles. 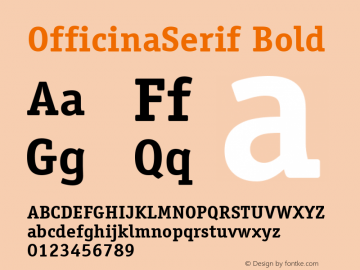 OfficinaSerif-Bold font family series mainly provide Regular and other font styles. 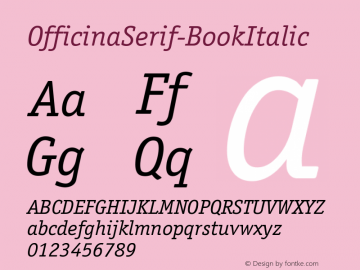 OfficinaSerif-BookItalic font family series mainly provide Regular and other font styles. OfficinaSerif font family series mainly provide Regular and other font styles. OfficinaSerif-Book font family series mainly provide Regular and other font styles. 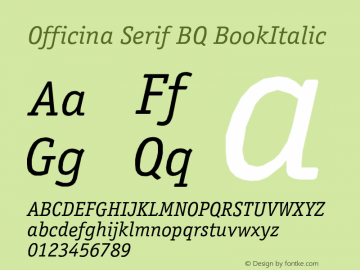 Officina Serif BQ font family series mainly provide BookItalic,Book,BoldItalic,Bold and other font styles. ITC Officina Serif font family series mainly provide BookItalic,Book,BoldItalic,Bold Italic,Bold and other font styles. ITC Officina Serif LT font family series mainly provide BookItalic,Book,BoldItalic,Bold Italic,Bold and other font styles. Officina Serif ITC font family series mainly provide Book Italic,BookItal,BookItalOS,BookOS,Book,BoldOS,BoldItalOS,BoldItalic,Bold Italic,Bold and other font styles.